Come fall, high school age ANA Synchro athletes often join their school’s speed swimming teams in addition to returning to synchro. But does competitive racing really mix well with synchro? “Yes!” says ANA Synchro Head Coach Leah Pinette, who swam on her high school swim team while maintaining synchro as her primary sport. “It’s a great conditioning tool for the beginning of the season. When I tried out, I didn’t really know the proper techniques or how to start and turn properly. Being on the racing team helped me develop good stroke technique, which, in turn, helped my synchro.” Pinette still holds records at her alma mater in the 200 free relay and 400 free relay. 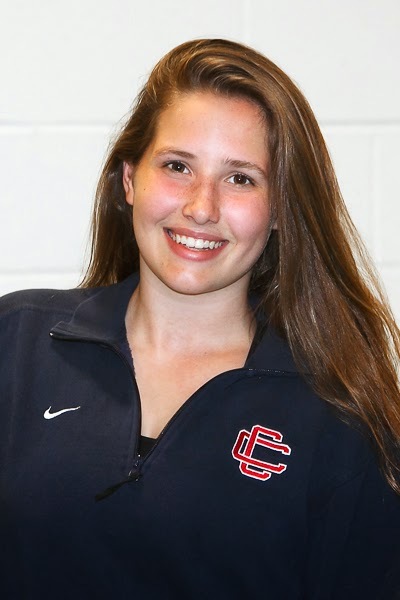 ANA Synchro athlete Evan Costanzo swims for Central Catholic High School in addition to synchro. 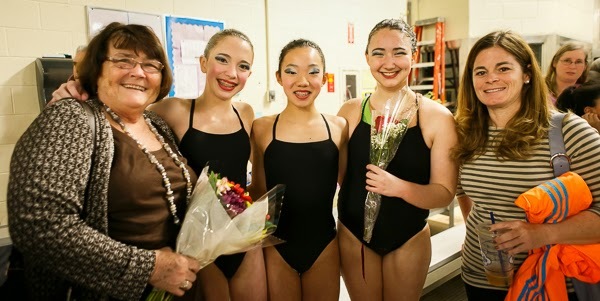 Read on as ANA Synchro talks to Andover High School Head Coach Marilyn Fitzgerald and North Andover High School Head Coach Erin Cammann about what synchro athletes can be doing over the summer to prepare for high school swim team training camp in August. ANA Synchro: Do synchronized swimmers make good competitive racers? Coach Fitzgerald: Over the years we've had many girls crossover from synchronized swimming to swimming for Andover High School, and it’s an easy transition. I am gleeful when I get synchro girls to be on the team. The one thing they have that I like to use as an example to all of the kids on the team is phenomenal breath control, which is so important for going into and out of your turns in a competitive race. And they have a great ability to streamline, which is something they've learned since they joined synchro, so I don't have to spend much time explaining that concept to them. Coach Erin: I agree with Marilyn! We love it when we hear there are synchro girls coming to NAHS. They may not have racing experience, but they are so comfortable in the water that they pick up on racing skills really quickly. Some kids get in the pool and think they need to splash a lot in order to go anywhere. Then you look at the synchro girls-- they just glide along and make it look easy. They instinctively know how to be smooth and efficient when they move through the water. ANA Synchro athletes (l-r) Grace Alwan, Sophia Ju, and Nicole Carzo will trade their glitter & sequins for the blue & gold of Andover High as they take on the challenge of high school speed swimming this fall with Head Coach Marilyn Fitzgerald (l) and Head Diving Coach Becky Pierce (r) who came to watch the team’s annual show in April. ANA Synchro: Is there anything ANA Synchro athletes can be doing over the summer to prepare for training camp? Coach Fitzgerald: If someone is trying out for the first year, my recommendation would be to get some running in over the summer. In the early parts of our season we do some running for aerobic training, which also helps strengthen their legs. I would also recommend a fitness regimen, which probably includes the very same things they do for synchro – stretching, sit-ups, and anything for core because core is huge in swimming. And they shouldn’t forget about nutrition. A lot of people take a vacation from eating the right food over the summer, and I would ask the girls to focus more on eating well. Coach Erin: Yeah, the running really gets everyone! I think a bunch of the girls on my team would say that preseason running is the hardest thing we do all year! But we do it to build up the girls’ strength, which will help them swim faster and—more importantly—avoid getting hurt. The whole point of preseason is to establish a good foundation for the rest of the season. We are careful—both in the pool and out of it—to build the girls up gradually. If a girl comes to the first day of preseason after a summer of loafing around, she’ll obviously have a harder first couple practices than a girl who has gotten regular exercise. So, the more active you are through the summer, the easier your adjustment to the start of the season will be. ANA Synchro: What about swimming? Should they do laps? Coach Fitzgerald: Obviously the swimming part is important. If girls have a backyard pool or have access to a pool to practice in, they can double the amount of laps they normally do. And they can work on kicking skills. We have done more with fins over the last couple years with great results, so I would suggest wearing fins during laps and do some power kicking. But really, most of all, I recommend coming in with a great attitude and be willing to learn something brand-new because they’re going to hear things that they haven't heard before and they’re going to be asked to do things they haven't had to do before like swim longer yardages. But synchro girls already have the discipline to learn and the mindset to do what it takes to get the job done, especially when they’re trying to do something for the team. 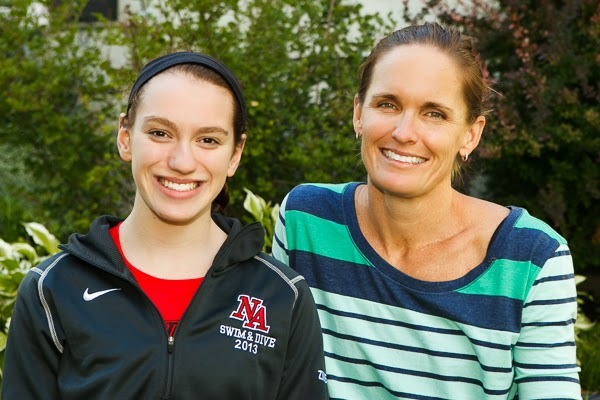 ANA Synchro athlete Maxie Zimmerman enjoys swimming for North Andover High School Head Coach Erin Cammann. Coach Erin: The synchro girls are usually ahead of the game because they start the preseason being used to spending long hours in the water. If girls wanted to swim some extra laps during the summer just to reassure themselves that they’ll be okay, that wouldn’t hurt them. But honestly they’ll be fine. Their base level of conditioning and water comfort will be a huge asset once the season starts. ANA Synchro: They probably learn a lot on your teams! intentionally, then they want to intentionally make it right. Coach Erin: I think the most valuable things they’ll learn will be about what it means to be on a high school team. The girls at NAHS have a ton of fun outside of the water. They organize spirit days—my favorite last year was when they all came to school dressed up like cowgirls—and the upperclass girls take turns hosting pasta dinners on the nights before swim meets. They do a great job creating a network for each other. The older girls give advice about which classes to take and which teachers to seek out, they support each other as they work toward all their goals—both individual ones and team ones—and they just basically become incredibly close to each other. I love high school swimming, and I am so happy each year to see the freshmen come in and realize how much fun it can be.